Got Church Records? We Can Help! Sometimes it’s hard to know what to keep (and for how long), and what can be thrown away. Caring for records can be challenging in the face of time limitations and multiple responsibilities. The Conference Archives is here to help you decide where to start! Although the archives houses only records of closed churches, part of our mission is to assist active churches in preserving their records. The CAH offers a yearly grant program to assist local churches with the preservation of historical records. The Commission makes available a total of $1000 for this grant program and distributes this amount through several smaller grants. The deadline for 2019 grant applications is Monday, April 1, 2019. We can prepare workshops for your local church, provide on-site help with sorting and organizing records, and even help you create a customized records retention schedule (a list specifying the types of records to be kept and for how long). We can also provide advice on appointing a church historian and establishing a committee on archives and history. We give at least one hands-on church archives and records management workshop per year, making an effort to rotate these geographically within the Conference. We will offer the next workshop on April 1, 2017 at the NY Conference Center, 20 Soundview Ave, White Plains, NY. A flyer is available here, and you can register online here. These services are examples of your apportionments at work. Contact us at archives@nyac.com or 914-615-2241 to learn about on-site visits and programs that the C. Wesley Christman Archives can customize and present to your local church leaders. 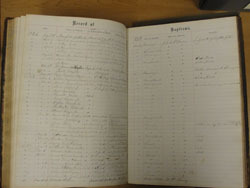 The General Commission on Archives and History's Guidelines for Managing the Records of the Annual Conference and the Local Church.